I'm not sure what the etiquette is on cross posting between Pilejoint and Pixelation, but I remember getting valuable input in both places simultaneously, so I hope those of you who frequent both places don't mind. I'm working on sprites for a roguelike game and I'm interested in your critique. The game uses 32x32 sprites for almost everything. 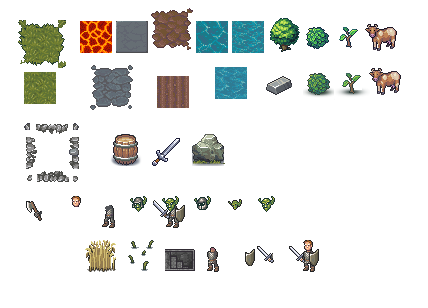 Currently I'm trying to make one sprite for every function because there's a lot to cover, but variation is possible. Due to the size constraint, I'm not concerned with scale very much, trying to make good use of the available space instead. The game will feature advanced tactical situations so it's important for the symbols to be readable. Likewise, I'm not aiming for a very consistent view angle. 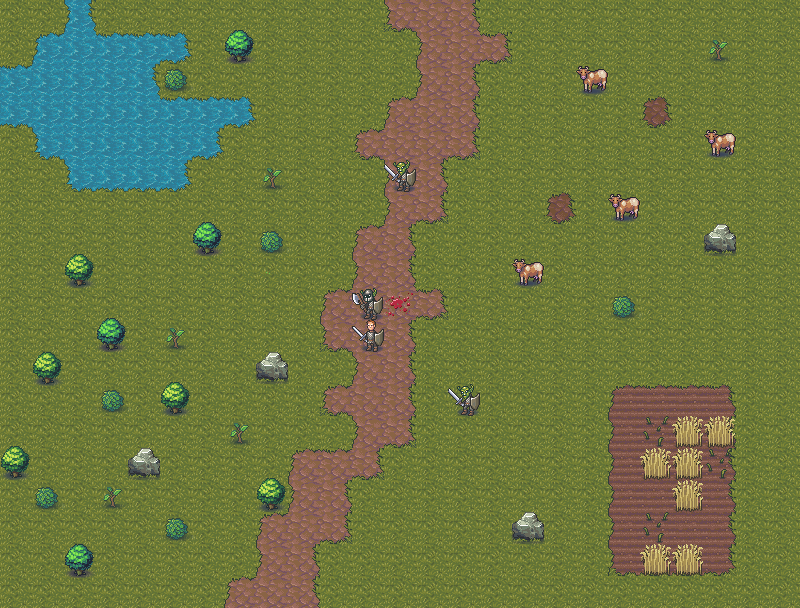 As long as everything is only slightly top-down, I'm satisfied - unfortunately you can put much more information in a side-view sprite, while the game itself is obviously viewed from above. So the display is rather symbolic in this regard. -wall sprites are composed of 8 possible sprites total (2 horizontal, 2 vertical and 4 corners). -I've prepared borders for transitions of the floor sprites. -The bush and sapling sprites have little impact other than visual so I've decreased their contrast, even though I think the original versions visible in the spritesheet above look better on their own. 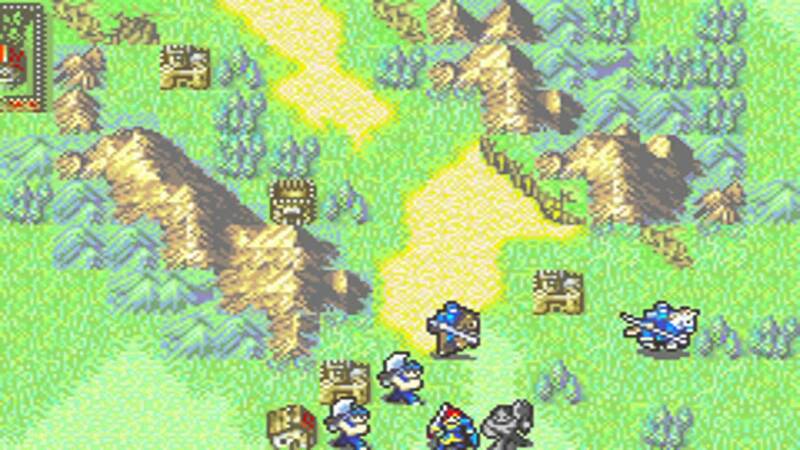 -The unit sprites are composite, to reflect the unit's equipment. 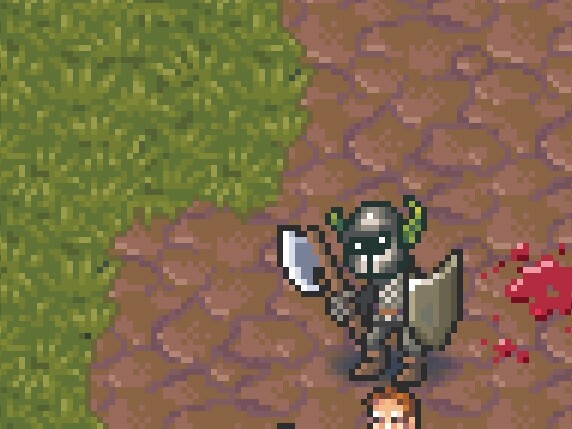 You can see a human warrior in chainmail, with no helmet, a sword and shield. 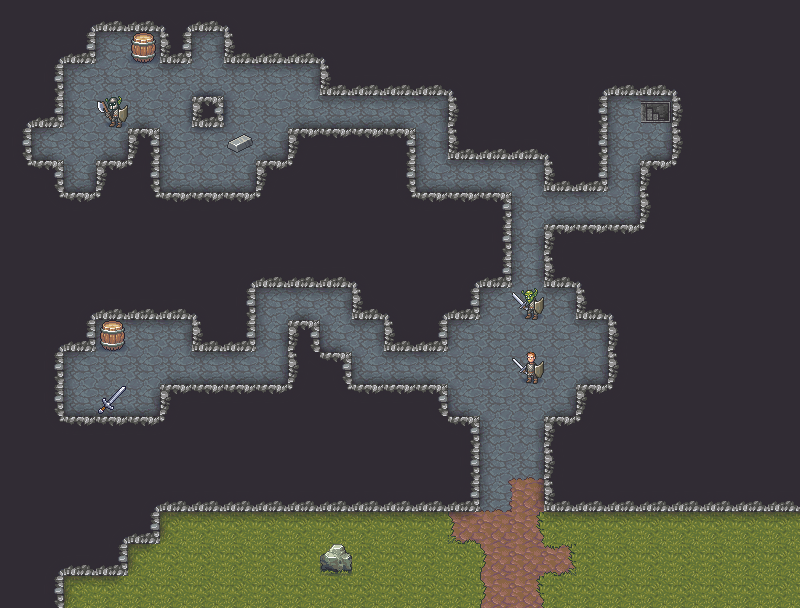 -There are automatically generated non-pixelart shadows around walls, to help improve readability of the view. Likewise, I'm happy with soft non-pixelart shadows around sprites. -I think the bigger problem is the uniformity and attractiveness of the overall colour scheme, unfortunately the sprites are to be used in multiple situations, so it's hard for me to work out a compromise that both looks good overall AND is readable. Readability has priority here. -The graphics are intended to be viewed at 100% size. Alright so, I'm not a very good pixel artist but there are a few things I noticed that I think could be fixed with your art! Firstly, I think the outline border between the grass and the dirt is really dark and makes it stand out more than it should. I've included a quick edit below! Second, I know you said you're not focusing on creating an accurate perspective but I believe it would be very easy to make the dungeon area look much better by adding another tile to the top walls. 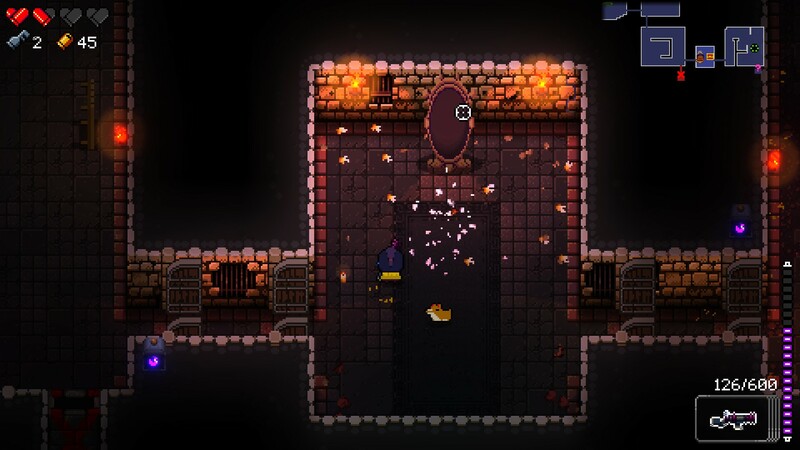 Examples can be seen in Enter the Gungeon and other games that take a similar perspective. And lastly,I think the readability could be helped if you made the sprites more saturated against the backgrounds, at the moment they kind of blend in. You might also consider using different colors for the characters, seeing as the backgrounds are green and brown and the characters are as well. Maybe use red and other contrasting colors. A good example of this done right is in the old FE games. And like I said before, I'm not really a great artist so take my suggestions with a grain a salt. I just wanted to help because no one else has replied in over a month! 1. Goblin sword have to many colors (whic is not a texture) on the blade, although human sword looks quite nice - maybe the goblin's one would be better with the same technique. 2. Wheat looks no so detalised, as the other textures. 3. Rocks and stone texture itself have some unattached pixels, so they look noisy and unfinished. Hope that helps and long days to DF!